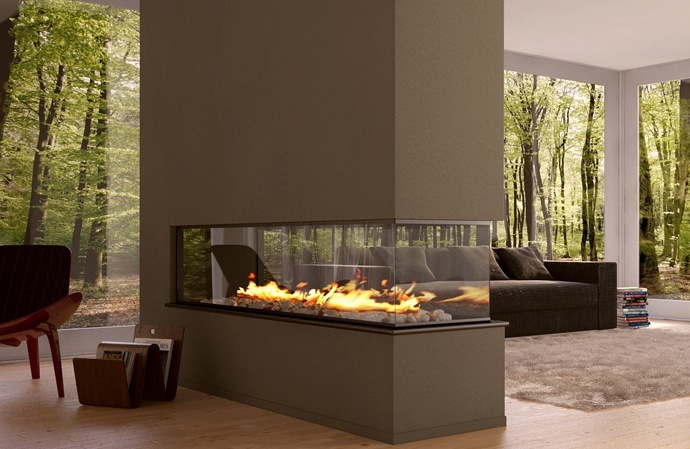 A stunning modern fireplace with a see through glass that wraps around the chimney and heats the entire space. Anyone searching through the National Building Regulations for information about chimneys and flues, hearths and fireplaces, might go straight to the part that deals with Fire Protection. The next step would probably to look through the part that deals with Walls – after all chimneys are often built with bricks and mortar and often extend from a wall. Or Roofs might seem to be a good place to look. But no, you are not going to find the information you are looking for in any of these three sections of the NBR. The information you need is in Part V of the Act. This section is very short, and deals only with the design, construction and installation of fireplaces and hearths that have chimneys and/or flues. “(1) Any system of space heating in any building shall be so designed, constructed and installed as to operate safely and any flue, flue pipe or chimney used in such system shall be so designed as to safely remove any smoke or noxious gases produced by such system. “(2) The requirements of sub-regulation (1) shall be deemed to be satisfied where the design and construction of any flue pipe, chimney, hearth or fireplace complies with SANS 10400-V.” That’s it. SANS 10177-5, Fire testing of materials, components and elements used in buildings – Part 5: Non- combustibility at 750 °C of building materials. SANS 10400-A, The application of the National Building Regulations – Part A: General principles and requirements. SANS 10400-B, The application of the National Building Regulations – Part B: Structural design. Like all the published SANS, it has a list of useful definitions, some of which you will find in our Glossary of Terms. Hearth and fireplace are not defined! Chimneys must be designed and erected from materials that are non-combustible – which of course stands to reason. It is also important that they don’t become a fire hazard, particularly to those materials adjacent to the chimney structure. Further, chimneys should not reinstalled in shafts or ducts that might be affected by heat. Timber is one of the combustible materials that we commonly use in our homes, and the regulation states that elements including joists for timber floors, trimmers or roof trusses may not be built within 200 mm of the inside of any chimney. There are additional regs that relate to dimensions, for instance where the walls of a brick or block chimney are less than 190 mm-thick, it must be lined with a flue lining that is made of a material that will withstand the action of any flue gases and won’t crack or soften. The flue lining must also extend throughout the full height of the chimney. There are also regulations that relate to the height of the outlet – this has not changed since the regulations were published previously in 1990 (and of course you can download these free). Below you can see the chimney positions. This is all largely common sense. Flue pipes may not be designed or installed if they are going to become a fire hazard to adjacent material. They may also not be connected to shafts or ducts that form part of any ventilation system. And they may not be installed in shafts or ducts that are likely to be adversely affected by heat. Any fireplace that is used for burning “solid fuel” MUST have a hearth that is make of a non-combustible material that is sufficiently thick. It must extend no less than 500 mm in front of the grate or fire basket and not less than 300 mm beyond each side of the grate or fire basket. Timber floor joists and trimmers – or any other combustible material – may be built into a hearth. Hi, recently we had an old defy rayburn heater installed. The installer kept the cement brick chimney with the old inner tube and only fitter a chimney from rayburn to the chimney. It looked and seemed fine, and it worked well, then the chimney turned a funny milky colour, we called the installer who told us he wasn’t sure and would come back to us, but he didn’t. Then yesterday evening the chimney collapsed and it nearly cost us our home but we managed to put the fire out in the rayburn. The next day we asked an independent person to come and have a look. He was shocked to see the chimney as it was made of galvanised steel 1mm thick and then funny colour was because of the toxic material burning. Is this true and where does one go to report if this installation is not correct and dangerous! When galvanised steel is heated it becomes highly toxic and very dangerous. A chimney flue would normally be made of mild steel and would be about 3 mm thick. When you refer to this person as an “installer” what kind of qualification/recommendation does he have. Does he work for a reputable company? Certainly he hasn’t followed SABS or building regulation specs, or even good practise. You definitely need to take some sort of action, perhaps via the Consumer Protection Act. My neighbour has submitted plans building an enclosed patio with an indoor braai. Lodge an objection with the local authority. We sell slow combustion wood fireplaces with glass doors. The coldest place on the fireplace is right at the bottom. 1) Do you still need 500mm in front of the fireplace if the fireplace has a glass door ? 2) Can we use 8mm Armourplate glass ? It seems to be very common in Europe to use armourplate glass. You are the person dealing with these so it is you who needs to approach the SABS for advice and further information. Not me! Please assist with legality of a next door neighbour’s chimney. This chimney has a solid cover with 4 openings on the sides of the chimney. When a fire is lit, the cover or roof part of the chimney prohibits the smoke from going up an together with the wind it blows right into my house. This cause extreme health issues. What can I legally do? Contact your local authority and ask them to send a building inspector or health inspector to look at the chimney. They are in a position to force your neighbour to make changes to the chimney if necessary. I want to build an outside fire pit. Is there any specific building regulations on the distance from your house and neighbors? What if you are in city area and live in duets what about smoke infringing on neighbours? This has nothing to do with the National Building Regs. It is rather a matter of public nuisance. You can call your local authority for advice. Hi, need some advice please. I had a wood burner (closed combustion type) (cast iron) installed recently and feel the installation is not safe. After query with installer they assured me it is safe but i’m not convinced. 1.The problem is the stainless steel flue goes through roof and the flues are mounted with a metal bracket onto the wood rafters. The only seperation between flue and rafters is a piece of the ceiling board they cut out to accomodate flue through ceiling. In fact the flue touches rafters in two place and at ceiling exit in roof the flue touches wood batton. Positive feedback. Owner of Company did site visit and will move the flues away from wood structures – he fully understood my concerns and committed to correct. Experiencing a problem with a double sided fire place whereby smoke is coming back into the house. I’ve had a chimney sweeper out, who has cleaned out the chimney, yet the smoky problem still persists. Rotating cowl has been serviced. Anything ideas as to what could be causing the problem? Sorry Heather, not my area of expertise. The good picture on this site for freestanding fireplace does not have hearth as stapulated in the SANS 10400-V: Space Heating regulation. How do you go around that? I want to install the same as it looks on the picture. combustible material of adequate thickness. 4.4.2 Such hearth shall extend not less than 500 mm in front of the grate or fire basket and not less than 300 mm beyond each side of such grate or fire basket. I thought the hearth is the material around the fire pot like for the wall unit. Thanks Penny for your response. If you have the ceramic tiles on the floor, would you still need another material on-top of the ceramic tiles to act as hearths or there is no need? Was this law relevent in 1988/ 1989? Buti, Ceramic tiles are fired in a kiln and so are fireproof. So no you don’t need another material on top of them, providing the thickness is as stated in the regs. – No timber floor joist or trimmer or any other combustible material shall be built into any hearth. Note that this version of the regs can be downloaded from this site free. Please advise as the pictures & sub-titles on chimney installations on your website is turned-around if compared with the pictures in the 2010 government version on this section? Refer page 6 on the attached document compared to the website pictures under chimneys. Pictures for less than 10% roof pitch & opening adjacent structures are turned around compared to the original government file? We are not aiming to replicate SANS 10400; rather we are presenting information taken from the regulations. It is totally irrelevant which order the drawings are presented in! I think it does not refer to the actual order of the drawings but the descriptions/sub-titles of two of the pictures are different to the sub-titles used for the same pictures on the SANS document. This is not something that is covered by the building regulations.